Quiltville's Quips & Snips!! 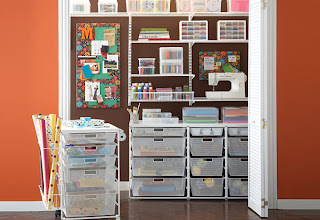 : Quilts, Caddies & Containers! Bins, Boxes, Baskets, Bags, Buckets, Barrels….if it will hold fabric and or notions we will carry our stuff in it! We had such a great time with the Heritage Quilters of Huntsville yesterday….but what really was fun for me was to go table to table and look at the goodies that everyone brought. You know, we all have our favorites --- certain things that MUST accompany us to class, that make our own personal sewing space that much better for us! What about a repurposed cutlery container from the goodwill?! I liked the compartments in this one! Cardboard boxes are NOT just for shipping! Boxes of uniform size can be filled with strips and squares, labeled easily and stacked on shelves with full projects in them! Plastic containers with lids come in all sizes. Nice because they are see-through….and I can’t resist the storage aisles at any given store…. OH WAY TOO CUTE AND TINY!! This little storage bin just FIT Lisa’s cornerstone squares! Lisa also had this adorable felted wool thread caddy. Can you see how the thread runs through ALL the needles in the cover? Just pull one needle AND the thread……….perfect! A friend made this for her….what a sweet gift! And LIsa had more to share! What about using a toothbrush case for pens , pencils and other markers? This is the front and back of a pocket caddy…made to fit over a 5 X 7 $1.00 picture frame! Wouldn’t these make great gifts?? Because there are pockets on both sides of the caddy, look how much stuff is accessible at her fingertips? And of course we all did our best to EMPTY this container before we could fill it with other quilty stuff! YUMMMMMMM!!!! There is more to share from yesterday’s workshop…but I’ve got to be there for today’s workshop…in 15 minutes..so I’ll upload MORE later! Nice and inventive People in Huntsville! I saw something I could make to give to my quilty friends this year...the ideas are endless. Have a fun day! Drolling over the storage closet in the first photo, Wow! so many clever ideas. Love all the storage ideas. Always looking for ways to make things neat and organized. i love that felted needle & thread holder so cute. Does Lisa have a pattern for that little needle and thread holder? I'd love to know where to get it. oh to be so organized! Wow, quilters really are resourceful. Do you know if there is a pattern for that picture frame tool holder? I really like that concept. Love your blog! I love all the prethreaded needles. What a clever idea! Great ideas. Wonderful to learn of new ways to store. OK, that picture frame pocket holder thing is really awesome! I need to see if I can figure that one out! I love it! What cute ideas. I just love your blog. You always share ideas that you see in your classes. For your generosity, I thank you very much. Love your needle case, she did a wonderful job on designing it. I have used double sided make up cases for embroidery projects and for travel, I use a nylon computer bag, holds books and projects. Love that thread and needle holder. It reminded me of when I was little.....every time I visited my grandmother, my job was to thread 10-12 needles on the same spool for her quilting. I visited often but she quilted even more. I thought I was such a big girl! The unending quest for a the perfect storage container, men don't realise that's all we really wqant! Love theese ideas, use some of them, will borrow the photo frame one I think!! I made one of those needle thread holders a few years back.trace the end of your spool onto paper. find a circle that is 1/2" in diameter bigger than your spool. use a Pill bottle, juice lid etc. Then trace this pattern onto a piece of cardboard. This is the template for the ends. cut out 4. cover each of these with yo yo's cut 1" in diameter bigger than the template. Gather these around the cardboard. And whipstitch 2 together with the gathers facing each other. Then wrap a piece of paper around the spool about 1 1/2 times and add 1/2" to the length of the spool this will be the length and width of the sleeve of the case. Add 1/2" Seam allowance to the length and width of this template and cut (2) pieces of fabric. Whith right sides together Stitch these pieces together on 3 sides and turn right side out and stith the opening closed. Looking at the picture stitch the circles halfway around the to each end of the sleeve. Stitch a ribbon to the end of the sleeve and wrap the sleeve around to place a button. I love that pocket caddy! I am constantly amazed at the creativity of people to come up with little things like the caddy that can make a big difference in our quilty lives! Thanks for sharing the pics. I wonder if that pocket caddy has a copyright on it? I can't resist plastic storage boxes. I have to be forcibly restrained from buying them. That green mini laundry basket is sooo cute. When I am working on a project, have 20 blocks done but need to do another 20 -- what do you see people store them in? Have you ever seen something for 20 inch blocks? Or that half completed quilt top? Is it just fold it up and put in a sack? I know pizza boxes sometimes works good, but should we be concerned about storing good fabric in card board, should we line it in acid free paper?? Yes I have all sorts of plastic containers and plastic bags from sandwich bags to gallon size bags. Maybe need to go to a scrapbooking specialty store to see what they have to store larger sheets of cardstock. Take care - have a good day/class. Robert, in northern Iowa. Love this post! I always enjoy seeing other peoples ideas for storage. That little organizer that fits on the picture frame is great. Thanks for sharing. Okay - you really must find and post the instructions or the pattern names for the needle and thread holder and the picture frame pocket caddy. Puhleeeaaasseeee??!! Oh love the thread holder! 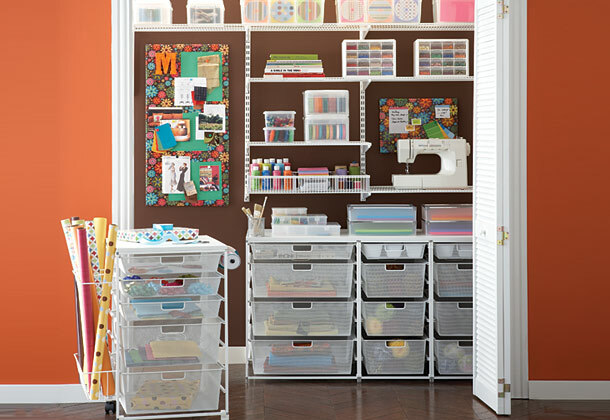 I love all these great storage ideas, now, if only I could get someone else to implement them into my studio! Here is the website with directions for the spool of thread holder. Someone commenting above asked about large baggies designed for 12x12 scrapbook storage. We buy 2 gallon zipper style baggies at the dollar store. Tuesday that feels like Monday! Got my tired carcass----BACK HOME! Tennessee Road Trip, Evening Edition! Evening Addition: Free Kindle Book! Feelin’ Down & Out?! Who, ME? !